Herman Miller cubicles are characterized by durability, innovative design, and exceptional modular performance, and the selection of used Herman Miller workstations from Panel Systems Unlimited live up to that description. We only sell used cubicles that pass our strict quality standards. We begin with superior used products, and when our experienced office furniture professionals skillfully clean and retouch them, the results are workstations that look like new. 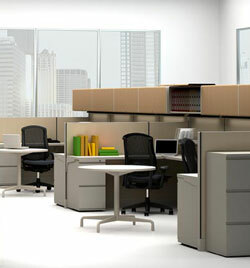 So when you purchase used or remanufactured Herman Miller cubicles from our inventory, you can rest assured that they will complement your existing systems furniture or create the fresh look you want. Whether you want five Vivo Interiors series workstations or 100 Action Office System cubicles, when you purchase Herman Miller cubicles from Panel Systems Unlimited, you also receive professional space planning services. Our design and layout specialists will create a detailed CAD drawing of your workplace and pre-plan your installation to ensure the cubicles you purchase contribute to improved office workflow. Our installation teams take care of everything from assembly to electrical, and will even remove your old furniture for liquidation. Contact Panel Systems Unlimited today for more information on cubicles for Asheville, Knoxville, Tampa, Charlotte, Louisville, and beyond. We also carry Steelcase, HON, Haworth, Allsteel, Kimball, and more trusted brands.